1958: Motor is a type 4W65 side-valve of 3956cc, 105hp at 3400rpm. Wheel-base is 2200mm. 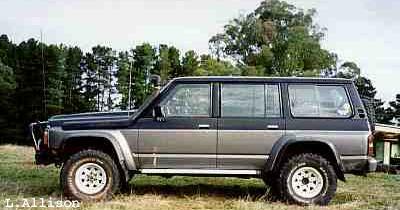 The Nissan Patrol G60 was produced in short, medium and long wheel-base versions. 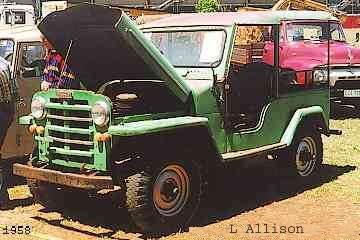 It had a 3-speed manual transmission and 2-speed transfer case with part-time four wheel drive. Styling was of the "straight up and down school" but the proportions worked out quite nicely. The motor was a 6-cylinder unit of approximately 4 litres capacity; some have now been converted to large capacity V8s. The shackle pins on the leaf springs were of the kind that require greasing. The shackle plates were at the front of the front springs. Contemporary rivals: Toyota LandCruiser 40-series and LandRover Series I-III. 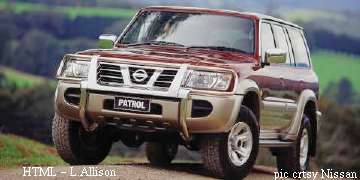 The Nissan Patrol MQ was quite a step-up in terms of comfort from the Jeep-like Nissan Patrol 60's. Suspension was by live axles with leaf springs. These springs are unusual in that all the leaves are full length. The leaves are separated and only touch at pads at their extremities. 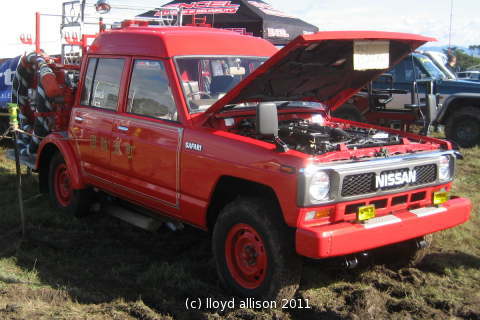 The GQ was the first Nissan Patrol with coil springs, released in Australia in 1988. The standard coils sag and limit axle movement, but a GQ Patrol with after-market springs can be quite agile. The one pictured has had a 45mm body lift, new springs and has 33" tyres fitted. The body lift is achieved by inserting thicker, specially fabricated body mounts. The anti-roll bar for the rear coil suspension was an innovation in that it can be disconnected (without the driver leaving the cab) so that it does not interfere with large axle movements off-road. The ute versions of the Nissan Patrol continued for some time (1996+) with leaf springs, but a coil-spring ute was added in late 1994. Some long wheel-base Patrols come with a high roof. This gives extra internal room but can be squeezy in a low garage and can make finding a suitable roof rack difficult. The short wheel-base (SWB) Nissan Patrol (above) really does have a short wheel-base; it gives the strong impression that the track is nearly as large as the wheel-base. This has been a trademark of Nissan's shortest SWB's since the G60. 1997: Nissan Patrol GU revealed at the Frankfurt (Sept) and Tokyo (Oct) Motor Shows. 1997: The Nissan Patrol GU, Nissan's replacement for the ten year old GQ Patrol, was revealed at the Frankfurt Motor Show, September 1997, and brought to Australia for the Sydney Motor Show, October 1997. It went on sale in Australia in December 1997. The base model 2.8L turbo-diesel 'DX' started at $39,950 (.au), much the same as the base Jeep Cherokee, Land Rover Discovery, Toyota Prado, etc. of the era, which gave you a lot of Nissan motor car for your money. The top 'TI', with 4.5 petrol, 4-speed auto (only) cost $64,790. Initial engine options were a 2.8-litre turbo diesel engine and an enlarged 4.5-litre 6-cylinder petrol engine. The 4.2-litre naturally-aspirated diesel, much loved by long-distance travellers, again became available later in 1998. The GU has live axles, coil suspension, ladder chassis and part-time four wheel drive as in the previous model. The ST has a rear limited-slip differential and the TI a rear differential lock. Safety features included air-bags and ABS brakes. prices from DX 2.8L turbo-diesel manual $39,950, to TI petrol, auto, $64,790 ($au). 1999: A turbo-charged version of the 4.2 diesel was made an option in the Nissan Patrol GU station wagon. 2000 April: The 2.8 turbo-charged 6-cylinder diesel option in the Nissan Patol GU was replaced with a 3-litre turbo-charged, intercooled 4-cylinder diesel (116kW at 3600rpm and 354Nm at 2000rpm). The 3.0 is a "modern" efficient unit and the 4.2 is really an old "truck" engine. However, the latter was a steady seller with those looking for long distance reliability and suspicious of modern technology. (The new 4-cylinder unit suffered a spate of engine failures before the lubrication system, and capacity, were upgraded.) The 3-litre diesel has 4 valves per cylinder operated by double overhead camshafts. Twin balance shafts reduce vibration. The 4.2 unboosted diesel was dropped. 2001 October: Nissan introduced a new TB48DE 4.8-litre 6-cylinder 24-valve dohc engine (185kW at 4800rpm, 420Nm at 3600rpm) into the Patrol wagon range. Other engine options are the ZD30 3.0-litre turbo-charged diesel, and the 6-cylinder 4.2-litre turbocharged diesel. prices $46,540 3-litre diesel DX, to $70,740 petrol auto' Ti [$au 10/2001]. 2003 February: New intercooled 4.2-litre turbo-diesel option TD42Ti (.au) -- 114kW at 3600rpm and 330Nm to 360Nm. Other engines: 4.8-litre petrol and 3.0-litre diesel turbo. 2010 February 13, Abu Dhabi: All-new seventh generation Patrol, new V8 engine ('VK56VD' 5.6-litre), 7-speed automatic transmission, and a new 4WD system. 2012, October: Nissan released details of the Y62 "... all-new Nissan Patrol ... new 5.6 l V8 ... set for a [.au] launch at the start of February 2013, from au$82K (ST-L) [and] au$114K (Ti-L)." front and rear suspension by independent double wishbone. The previous Y61 model (with diesel option) continued to be sold in parallel.